Port Royal was once a 17th-century haven for hedonistic pirates and malcontents dedicated to looting Spanish vessels throughout the Caribbean, until it was destroyed by an earthquake in 1692. 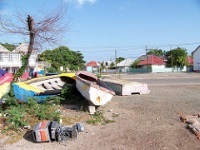 Today, the former haunt of notorious pirates like Henry Morgan, Blackbeard and Calico Jack is just a fishing village, situated at the tip of a narrow peninsula stretching across the entrance to Kingston's harbour. Relics of the town's wicked past can be seen at the Museum of Historical Archaeology, the Maritime Museum and Giddy House (a building that tilts at an angle). Fort Charles is the last remaining of six forts originally built to protect the port. A highlight of the fort is entering the old prison cells where the pirate prisoners must once have languished. There is a restaurant, known for its great seafood, that overlooks the harbour. The village can be reached by ferry from West Beach Dock, Kingston, in about 20 minutes.